See the pictures and you be the judge! The new "It's Cool™" Drive Showers for Bravo 1 & Bravo 3 drives from Rex Marine have many new unique features and offer much improved cooling over previous models and other brands. First with No Exposed Bolts... The top cover is polished, smooth and sleek. 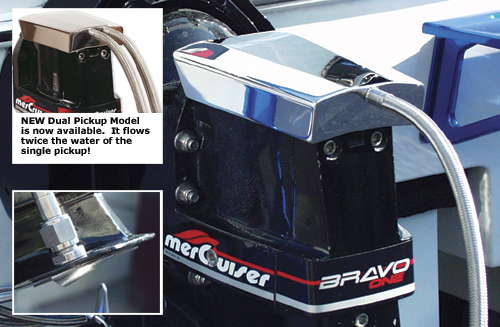 First with the New Stainless Pickup patterned after marine scoop water pickups from the early days of performance powerboating cools much better and supplies a constant flow of water to the drive's top bearing cover even at high trim angles. New -10 AN connection pickup secures tightly to the drive's cavitation plate and scavenges water from the underside of the plate surface. No extra unsightly brackets hanging off the plate. New Dual -10 AN Pickup model flows twice the water and replaces other unattractive tubular style dual pickup drive showers. Prior designs have relied on scooping water up below the drive, subject to prop disturbance and flow interruption from high trim angles. Our testing has shown water off the surface of the drive's cavitation plate provides more consistent water flow and pressure. Conversely, the low-profile sleek scoop pickup does not cause disturbance to the water entering the propeller stream like many drive showers with lower extended pickups are known to do, which can cause prop cavitation and / or slippage. Full -10 AN size pickup and 1/2" tube (.400 I.D.) insures maximum flow through the shower discharge tube. Multiple 5/16" I.D. holes help assure the discharge tube does not get plugged with foreign matter and debris, which is a big problem with showers with small outlet holes. All T-316 Stainless tig welded construction for maximum corrosion resistance and strength. The It's Cool™ Drive shower will not fit the late model Bravo drives with the finned caps. 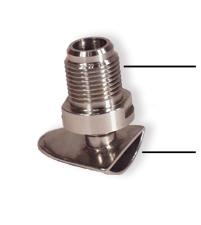 Fabricated T-316 Stainless -10 AN Pickup Assembly tightens securely against the drive's cavitation plate. No unsightly brackets hanging off the rear of the plate. New unique scoop pickup patterned after 1960's style water pickups provides more cooling water than most longer pickups and doesn't disturb the water flow into the propeller.